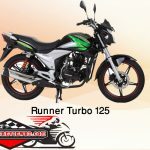 Runner Turbo 125 Motorcycle Bangladesh 2017 price is 1,30,000.00 BDT. Runner turbo 125 is a 125cc motorcycle. Runner turbo 125 motorcycle is made with stylish design and great standard type outlooks, which is able to attract the riders. turbo 125 full body shape is not so lesser or bigger in size but it wider than the other 125 cc motorcycles and the design is outstanding. For making the stylish outlooks more beautiful Runner has used fantastic color combination for this motorbike. Runner turbo 125 is created with first-class body dimension and because of this cause the controlling side of this bike is really well. At the dimensions turbo 125 has 2200 mm length, 1780 mm width and 820 mm height. Without this turbo 125 also fine ground clearances of 165 mm, well wheel base of 1320 mm and a good weight of 133 KG. As 125 cc commuter motorcycle this kind of dimensions is really promising. Turbo 125 has 124.6CC, Air cooled, and 4 stroke Petrol Engine. This type of engine can give superior performance as a commuter category motorcycle because this engine can produce 8.4Kw @ 8500 rpm max power and 11.0 Nm @ 7000 rpm max torque. Without these features Runner turbo 125 motorcycles contains some other good features. 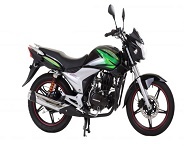 Such as good Carburetor, Ignition system, starting method, good spark plug, so we can say that as a 125cc motorcycle this motorcycle undoubtedly contains good engine. As a 125cc motorcycle Mileage of Turbo 125 near about 55 KM/L (Approx). At the top speed this stylish bike is not so bad at all; it will give about 110 KM/H top speed for the riders. 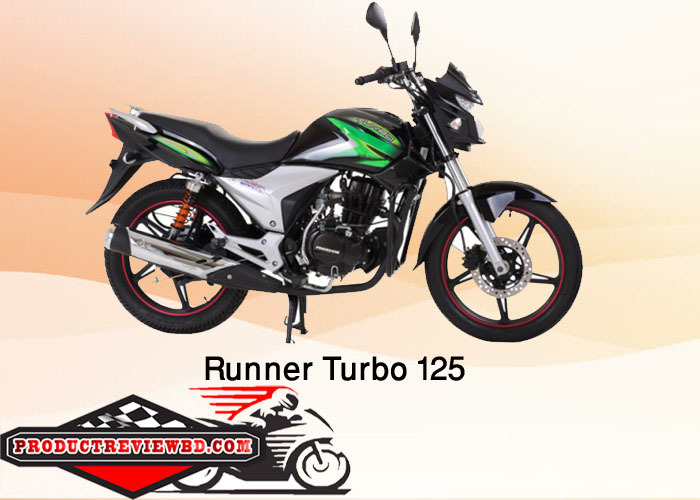 Runner Turbo 125 has the combined braking system of Both Disc and Drum brakes, at our country base this braking system is really good. With good braking system this motorcycle also contains good suspensions. At the suspensions this bike has Hydraulic Telescopic suspension at the front and Coil spring Hydraulic, 5 Stage adjustable suspensions at the rear side. At the tyres Runner has used good quality tyres for Turbo 125 and their measurements are 2.75-18 at the front and 90/90-18 at the rear side. At the electrical side this bike contains excellent features, such as at the 12V 7Ah battery, at the head lamp it has 12V 35W/35W 3W; at the tail lamp it has 12V 21/5W, Digital speedometer and good quality turn light also. 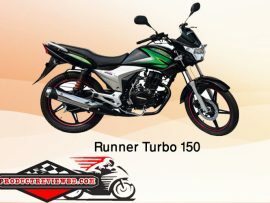 Runner Turbo 125 is a product of Runner. This bike is powered by 124.6 engine which generates Maximum power 8.4Kw @ 8500 rpm and its maximum torque is 11.0 Nm @ 7000 rpm. Runner Turbo 125 can runs 110 KM per hour and it burns fuel 55 KM per Liter (approx). Runner Bullet 100 Motorcycle Price in Bangladesh 2017 is 1,05,000 Taka. Dayang Runner DY50 Motorcycle Price in Bangladesh 2017 is 72,000 Taka. 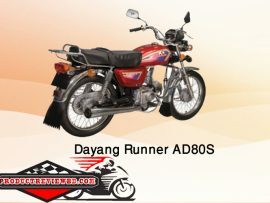 Dayang Runner AD80S Motorcycle Price in Bangladesh 2017 is 81,000 Taka. Runner AD80S Alloy Motorcycle Price in Bangladesh 2017 is 81,000 Taka. 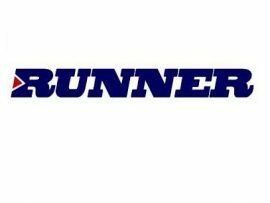 Runner Royal+ 110 Motorcycle Price in Bangladesh 2017 is 1,01,000 Taka. 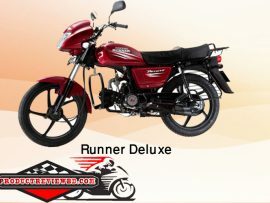 Runner Deluxe Motorcycle Price in Bangladesh 2017 is 83,000 Taka. Runner LML Freedom Motorcycle Price in Bangladesh 2017 is 1,25,000 Taka. Freedom Runner Kite Motorcycle Price in Bangladesh 2017 is 80,000 Taka. Runner Duranto Motorcycle Price in Bangladesh 2017 is 59,000 Taka. Runner Cheeta Motorcycle Price in Bangladesh 2017 is 85,000 Taka. Ruuner Turbo 125 Price in Bd 2017 is 1,30,000 Taka. Runner Knight Rider bike/ Motorcycle Price in Bangladesh 2017 1,56,000 Taka. Runner Kite+ Motorcycle Price in Bangladesh 2017 is 86,000 Taka. Runner Turbo 125 bike is powered by 124.6 engine which generates Maximum power 8.4Kw @ 8500 rpm and its maximum torque is 11.0 Nm @ 7000 rpm. Runner Turbo 125 can runs 110 KM per hour and it burns fuel 55 KM per Liter (approx).